Observations, photographs, and video of the construction of a Frank Lloyd Wright Usonian house which serves as the Sharp Family Tourism and Education Center on the campus of Florida Southern College, located in the South Lake Morton Historic District of Lakeland, Florida. Follow this link for visitor information. Summertime in Florida is hardly the best construction season, and the carpenters - more like furniture makers - have to make the best of any opportunity to work in dry, sunny conditions. On Wednesday, that only lasted half a day, as usual. But as with the blocks, once the beautiful cypress is installed, it's done. No painting or decorating needed, so each new board adds a "finishing touch" as soon as it is put into place. See more in the September Gallery. Artsy features the world’s leading galleries, museum collections, foundations, artist estates, art fairs, and benefit auctions, all in one place. Our growing database of 250,000 images of art, architecture, and design by 40,000 artists spans historical, modern, and contemporary works, and includes the largest online database of contemporary art. Artsy is used by art lovers, museum-goers, patrons, collectors, students, and educators to discover, learn about, and collect art. The whole world is watching! We are re-telling the story of the project on our facebook page. If you "Like" it, you'll always know what's what as soon as we do! Our Video makeover is complete! Choose the main Video page, or any of the "year" pages to watch all of the project action in full HD. Also see The Blocks, The Glass, The Wood, The Fountain, and 3D Animation in crisp, clear high defintion. With so much happening at once during the final month, we thought you might find it helpful to have these links to our most recent blog posts. Just click the headline to go directly to the post. Stone, Steel, Glass, Wood, and Light! It's in all the papers! the News page for more. 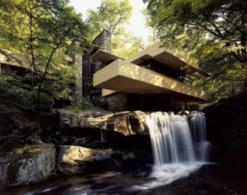 The Premiere of the historic Frank Lloyd Wright Usonian House took place October 31st. Dignitaries from the city, the county, and the college joined the donors, craftsmen, and professionals who made it all possible. 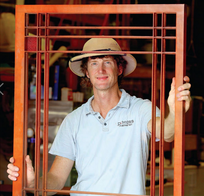 Watch our interview with Ken Berman who installed the glass inserts, and see how all of the 10,000 board feet of southern cypress was turned into ceilings, walls, shelves, and doors. Take a look at the last frenetic month in the October Gallery. 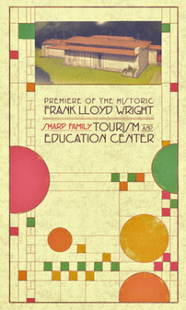 On May 20, 2010, Dr. Anne Kerr announced Florida Southern College's plans to construct a Frank Lloyd Wright-designed "Usonian House" which will serve as a new education and tourism center. Click here for a slideshow of the announcement posted on flickr in the fsc.mocs photostream. The site of Florida Southern College's latest addition to its Frank Lloyd Wright collection - the largest in the world in a single location - is on McDonald Street between Johnson and College Avenues in one of Lakeland, Florida's oldest historic neighborhoods. ... And then full bore! A breath of fresh air? Some of this ... some of that. Goodbye backhoe! Get ready to be floored! Sticks and ... hey, what are those things? Now that's making an entrance!